Pazu is in for the ride of his life. So a few hours ago, I saw Isshyo ni Sleeping: Sleeping with Hinako, which is easily the all time worst anime I have ever seen. 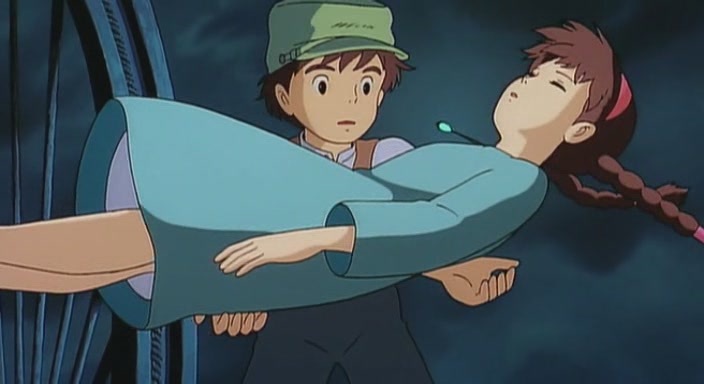 In order to cleanse that from my system, I saw the Miyazaki classic Laputa: Castle in the Sky. Pazu leads a normal life as an engineer’s apprentice in a mining town. That is until he sees Sheeta floating down from the sky. Thus begins the race to find Laputa, the castle in the sky against the army and pirates. What stood out to me first, as to be expected from a Miyazaki-directed Ghibli production, was the overall presentation of the movie. Laputa: Castle in the Sky (天空の城ラピュタ Tenkū no Shiro Rapyuta) was made only 2 years after Nausicaa of the Valley of the Wind, yet the animation is leaps and bounds better; of course Nausicaa was a great-looking movie to begin with. Character models are far more detailed, with little things like hair being meticulously animated. It’s quite clear that Miyazaki was really pushing the envelope as far as what his production team could do in the age before computer-assisted animation. A good example of what the animation team could do was the green glass bottle that Sheeta used to aid in her escape from the airship at the beginning of the movie; you can see what effort the animation team put into even showing how light refracted through that bottle’s glass. Laputa is yet another time when composer Joe Hisaishi scored a Miyazaki film. I will say the music generally is far superior to what was in Nausicaa as well; gone are the ill-fitting synthesizer pop tunes from the earlier film. What stood out to me was Inoue Azumi’s performance of the end theme. So Laputa has plenty of style. What about the substance? Laputa’s story was one incredible roller-coaster ride, but the movie’s real strength was the characters. None of the side characters were what they seemed like initially, but what I really loved was the chemistry the two leads had between each other. I think a lot of it had to do with how their respective voice actresses (yes, Pazu was voiced by a woman) worked with each other. Tanaka Mayumi (known for later roles like Monkey D. Luffy in One Piece and Krillin in Dragon Ball Z) and the really frantic movements of Pazu complemented Yokozawa Keiko’s gentler performance as Sheeta. In general, Pazu and Sheeta worked extremely well to make Laputa not your typical fairy tale romance. In fact, it’s mainly because of Pazu and Sheeta that Laputa: Castle in the Sky has officially beaten Porco Rosso (1992) as my favorite Miyazaki film. Laputa is often cited as Miyazaki’s best movie, and frankly I can see why. NOTE: As you can probably tell from my critique of the voice talent, I was watching the film in the original Japanese with English subtitles. As I do know some Japanese, I couldn’t help but notice that there were some glaring discrepancies between the spoken dialogue and the subtitles; it ranged from Sheeta saying her parents died in Japanese while the subtitles simply had her saying she lived with her parents to times where there were lines of spoken Japanese with no subtitle translations. After watching a few seconds of the English dub, it turns out the issue was that they were not subtitles, but dubtitles, meaning it was just a transcript of the English dub track. As Disney was clearly marketing the movie to an American audience, it was clear they wanted people to watch the English dub anyway and thus couldn’t be bothered to provide properly translated subtitles for the Blu-Ray release of the movie.